(Nanowerk News) Researchers at the University of Stuttgart develop a lightweight timber construction system combining robotic prefabrication with computational design and simulation processes, as well as three-dimensional surveying technologies used in engineering geodesy. In collaboration with Kuka, a manufacturer of industrial robot arms, and the timber construction and engineering company MüllerBlaustein, the partners investigate the potentials of robotic prefabrication in timber construction. 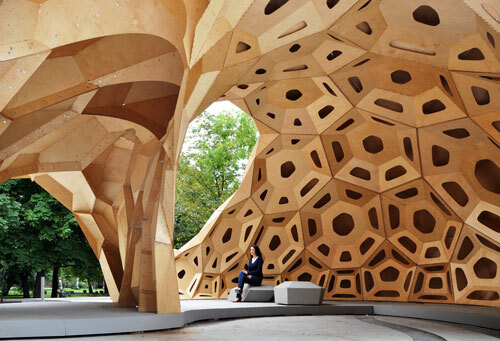 Their goal is to develop innovative, performative and sustainable construction systems made from wood, which also expand the repertoire of architectural expression in timber construction.